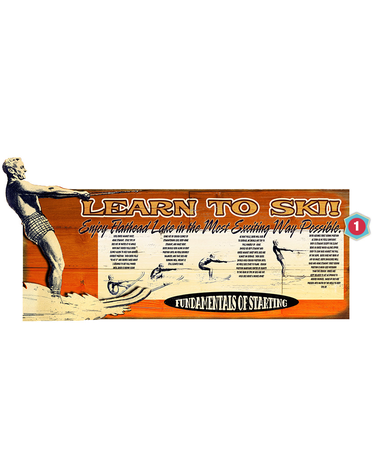 Before those guests who are uninitiated to the joys of water skiing jump right in, provide them with the fundamentals on our vintage “Learn to Water Ski Sign." This 17" x 44" sign can be personalized with the name of your lake! Enter your personalization as you would like it to appear using capital and lowercase letters, numbers, punctuation marks and characters. Do not type using all capital letters or all lowercase letters unless this is how you want the item to appear. And please review your personalization carefully, as your gift will arrive printed with the text exactly as entered. Please note--this sign is for indoor display only, as the skier is made from MDF board and cannot be exposed to the elements. This sign comes in two parts that create the two-dimensional effect; minor assembly is required. Pretty cool sign that helps you teach your friends how to get up on skis before you hit the lake.